A 21-year-old Stan Musial, on the cusp of greatness, relaxing before a game at Braves Field in 1942, his first full season in the majors. Photography by the great Leslie Jones, from the Boston Public Library collection. 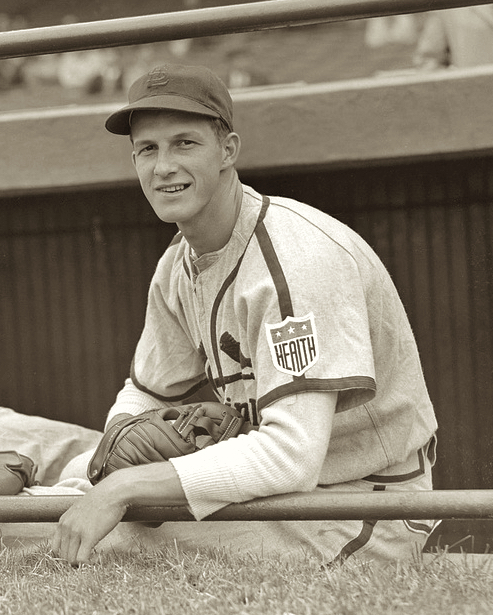 Musial would have a fine year in 1942, batting .315 in 140 games, helping the powerhouse Cardinals win 106 games and the World Series, but would begin his dominant play in earnest in 1943, leading the majors in 11 offensive categories, including a .357 BA, to earn his first All-Star berth and NL MVP award as St Louis cruised to another pennant with 105 wins. He’d have another great year in 1944 as the Cards again won 105 for a 3rd straight pennant, and second World Championship in 3 years. WWII came calling in 1945, but didn’t slow him down much, as he came right back in 1946 with another MVP award and World Series win, and garner one more MVP in 1948. The stats are astounding – 24x All-Star, 3x NL MVP, 7 batting titles, 3 WS rings; as one of the best National League players in history, no doubt he was certainly “The Man”! Click above (or at the top of this page) for more great classic baseball photos and stories! And don’t forget to follow us on Facebook and Twitter! More great reading with these classics of baseball literature, now on sale! Always thought Stan Musial was the greatest hitter I ever saw–he was like a coiled spring at the plate, perfectly covering the dish with his slight crouch deep in the batter’s box. As a kid, living and dying with the New York Giants, I always measured the Giants’ starting pitcher’s effectiveness by how he handled Musial in his first at-bat. If he got him out fairly easily, I figured the Giants’ pitcher really had it that day! You’re stats certainly tell the story, Tom. Remember, also, in 1947, he started poorly. Nobody could figure out why the great Stan Musial batted .146 in April and .224 in May. He was then diagnosed with appendicitis. Rather than operate, they froze Stan’s appendix so he could still play and finish the season. He batted .312, with 19 homers and 95 RBI. But for the second half of the season, Musial sizzled at .363 with an OPS of 1.008! The next year (1948), he had his best year crushing the ball to the tune of .376, with 39 home runs, missing the triple crown by one round tripper behind Johnny Mize and Ralph Kiner tied at 40.